And, if yesterday's Father's Day tweet is any indication, the two probably won't be on speaking terms any time soon. "Happy father's day," the 24-year-old Rhodes Scholar tweeted. 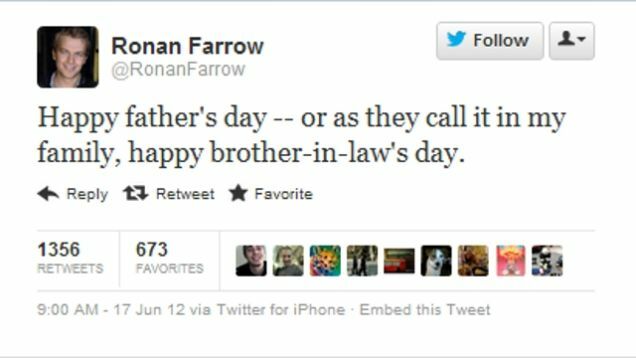 "Or as they call it in my family, happy brother-in-law's day." Adding fuel to the burn, Farrow's mom later retweeted the gibe and added a single-syllable emphasis: "Boom." Allen and Farrow's 12-year relationship ended in 1992 after his affair with then-21-year-old Previn was discovered.